Karnataka is the land of fiestas and festivals. Numerous art and culture festivals are hosted throughout the year, which gives one glimpses about Karnataka tradition. From the stunning extravagance of Dussehra in Mysore to the Makar Sankranti in Kununurra, every place across the state has its own festival. Having a history as long as many ancient civilizations, positioned in the crossroad of the South and the West, and being a multicultural society, Karnataka celebrates a wide variety of festivals, ceremonies and events. Fun, frolic and lots of dances - festivals in Karnataka is something one absolutely cannot miss. Whether it's the crack of the whip at the Kambala Buffalo Race or the reverberating dancing steps of folk dancers during the Hampi Festival, Karnataka has everything that keeps one hooked. In a state where one can see a rich plethora of culture and tradition, every festival celebration in Karnataka is a sight to behold. Be a part of the vibrant and colorful Karnataka. See below for the festival and fair that are commemorate in Karnataka is full zeal, enthusiasm, and vigor. It is during the month of January that Hampi architectural ruins spring back to life and bring people together to celebrate the grand extravaganza, Hampi Festival. Hampi, a spectacular town was once the capital of the glorious Vijayanagar Empire. "Vijay Utsav" alias the Hampi festival is commemorated from the times of Vijayanagar reign. 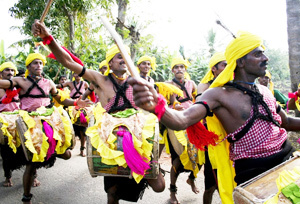 The festival is organized and hosted with enthusiasm and zeal by the Karnataka tourism. Main attraction of the festival is Kannadigas dance, drama, fireworks, puppet shows, spectacular parades, and musical instruments like drums and pipes, the same way it used to be in the colonial era. Through dance, music, drama and processions, organizers try to bring back the charm of the bygone era. Hampi festival is commemorated for three days. In the initial two days, dance and musical events take place. The third day of the festival is dedicated to a spectacular Jumbo Savari or an elephant march. During the third day, one can see elephants carrying howdahs, passing through the main streets of Hampi. Designed puppet shows and firework display are the other things that are put together for the festival. Noted celebrities and artist from every corner of the world are invited to grace the festival with their talent. With things like decorated elephants, embellished architectures and classical dance and music exponents, the festival reminds one about the lavish lifestyle of the colonial era people. The air widespread with the sound of the drums and pipes handcrafted by the descendants of the Vijaynagar craftsmen. People can also purchase from handicrafts and traditional commodities. If not a history and cultural event buff, then tourists can indulge in some pumping activities likes rock climbing, water sports, and traditional sports While in Hampi, it is a good idea to witness the crumbles of Hampi which despite being so old have retained its charm. Kambala festival brings the season of splash, speed, and power. More than 150 pairs of buffaloes are groomed specially for the festival, and are pegged against each other for the prize money. On the first day, a parade of participating farmers and buffaloes is organized and soon after the race begins. 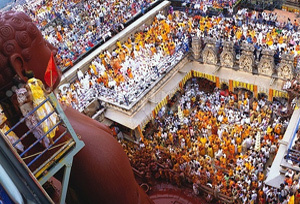 There are different beliefs related to the origin of the festival. Some believe that the festival is dedicated to Lord Kadri Manjunatha, an incarnation of Lord Shiva and to make him happy for a good harvest. Other believes that the festival was initiated by the farmer community of Karnataka. The festival also has a historical connect, as per the facts racing tradition was started by Hoysala Kings to see if buffaloes can be trained or used in wars. Negilu: This category is for buffalos that don't have any prior experience of racing. Farmer controls the pair of buffaloes with the help of the plough. There are junior and senior rounds in this category. Hagga: Only buffaloes that have an experience in racing can take part in Hagga category. During the race, both the buffaloes has a rope tied directly to them. There are junior and senior rounds in this category. 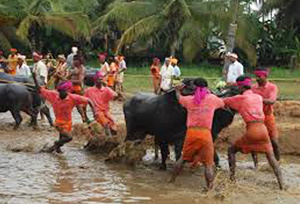 Adda Halage: In this category of competition, farmers stand of the wooden plank places on the buffaloes. Buffalos should have prior experience of racing. Kene Halage: This is one of the toughest racing categories. In this race, a round shape wooden block is attached to the buffalo. There are two holes in the wooden block through which water gushes out while running. 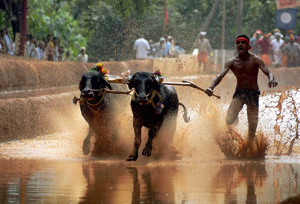 When: Kambala festival take place from November to March as the competition takes place in different parts of the state. It is advisable to contact organizing committee before planning a visit to the see the festival. Where: Baradi Beedu, Bolantur, Kolatta, Majalu, Puttur, Kamalakettu and Uppinagadi. The first thing that comes to mind when one mentioned the word "Pattadakkal" is the group of temples which deemed as the world heritage sites. The world heritage site, Pattadakal looks its very best during the grand music and dance gala, Pattadakkal Dance Festival. Constructed between 7th and 8th century, the Pattadakkal group of temples provides the perfect venue for the dance festival. The festival is organized by the Karnataka tourism with a purpose to bring together local artist and celebrate their art on international stage. "The Patadakkal Dance Festival" is also known as the "Chalukya Dance Festival" because Patadakkal was once the capital of Chalukyan king. Extravagant dance places take place against the backdrop of 10 beautifully carved Pattadakkal group of temples. The festival is a treat not only for the dance lovers also for artisans and craftsmen. Artisans from different corners of India gather and display their best specimens in the exhibition. 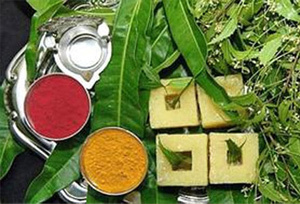 Ugadi symbolizes the New Year in Karnataka. The term "Ugadi" has its origin from two Sanskrit words- uga (age) and ādi (beginning): "the beginning of a new age." People wear new clothes, decorate houses, dance to the rhythm of folk music and commemorate the beginning a new year. Poetic recitation competition, chanting mantras in the temple, listening to the future predictions and a classical music concert is a part of the Ugadi celebration. If one wants to see the full glory of the festival Ugadi, one should visit the hamlets and villages of Karnataka. When: Between March and April. It all depends upon the position of moon. In Karnataka, Pongal is also known as 'Sankranti'. During the festival, people decorate their cattle and feed them 'Pongal,' a dish made of rice. A special dish called Ellu of coconut, sesame seeds, and sugar is made ready for the day. Cattle, decked up in colourful costume and their horns painted in bright colours, were taken out in a procession. A bonfire is also organized and decorated cattle are made to jump the fire as part of Pongal celebrations in Karnataka. Bhogi Festival: On this day all the old clothes from the household are burned in the bonfire. People wear new clothes and decorate their house. Kanu Festival: People offer prayers to cows, bulls, buffaloes and other farm animals. Cattle are adorned with accessories and a procession through the streets takes place. 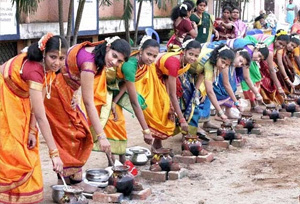 Kaanum Pongal: On this day, people go out, visit their relatives and share greetings with each other. Vairamundi festival takes place on the third day of the Brahmotsavam at the temple of Cheluvanarayana in Melkote. During the festival, Lord Cheluvarayaswami's statue is adorned with a diamond-studded crown that once belonged to Mysore's former maharajas. Every year, the festival is witnessed by more than 400,000 people. Along with the consorts and companions, the idol is taken out in a colorful procession throughout the city. Rajyotsava day alias the birthday of Karnataka is celebrated on the 1st November, every year. The State Govt announces Rajyotsava awards every year, which is given to people who have contributed to the Karnataka state. Dussehra is a 10-day cultural extravaganza for which Mysore in India. 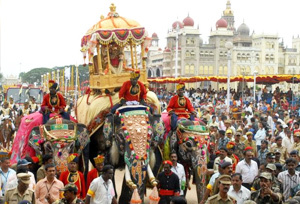 The festival starts with a procession of decorated elephants led by the Maharaja of Mysore – a grand spectacle. Every evening, Mysore Palace lit up and the streets of the town transform into a gigantic fairground, with concerts, dance performances, sporting demonstrations and cultural events. The festival is observed to honor the Goddess Chamundeswari who killed the demon, Mahishasur. On the 14th or 15th day of the month Aswija, a tiny hamlet called Vithappa springs back to life and hosts the grand Sri Vithappa Fair. During the festival, a tableau of deity decorated with cloth, banana leave and flowers is carried through the streets of the village. A contingent of 60 drummers, assembled from other parts of the state, accompany this procession. The number of devotees is increasing tremendously over many years. Most interesting part of the festival is seeing many urban people following ages old traditions. Several rituals are associated with the fair. Some devotees carry milk as an offering to the idol and believe it to be turned into curd spontaneously once the offering is made. Animal sacrifice is also a part of the festival, which is sold to devotees for a price by the priest of the temple. 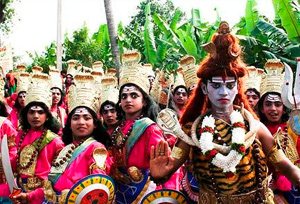 Tula Sankramana is celebrated with great pomp and show in the coorg district of Karnataka. At Talakaveri, the point of origin of the Cauvery or Kaveri river, people get together to have a dip in the holy water of Tala Kavery. A Fountain from a small tank springs up and fills another larger tank whenever the sun rises and faces the Tula Rasi. As per the devotees, a small quantity of this water, when fed to the dying members at home, will cut them from the cycles of births and deaths. Goddess Parvati, who took the form of river Cauvery, is worshiped by placing betel leaves and areca (palm) nuts, bangles, sandalwood paste, vermillion, and turmeric. 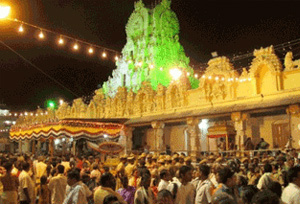 Every 12 years, millions of pilgrimages make their way to Gomateshwara temple for Mahamastakabhisheka. It is an important Jain festival, where the grand statue of Gomateshwara is bathed and anointed with milk, saffron paste and dusted with powders of turmeric, sandalwood, and vermilion. Each and every ingredient poured on the statue has a significance- water to cleanse the statue, sandalwood to spread the fragrance of Bahubali's virtues, kashkachoorna to beautify and cane juice to relieve hunger. The next Mahamastakabhisheka of Gomateshwara will begin in the first week of February 2018. Godachi Fair is a noteworthy festival that takes place in the first month of Kartik in the small village of Ramdurg Taluk of Belgaum district. The feast is commemorated in the honour of Shri Veerbhadra, the chief god in the Veerbhadra temple and an imperative attendant spirits of Lord Shiva. A fair is organized every year by Karnataka Tourism featuring food stalls, rides, games, traditional celebrations, etc. Tourists should plan their next holiday to Karnataka somewhere around these fairs and festivals. From dates to highlights, one will find everything here.